Cayman’s junior golfers are shining this year, thanks to support from HighWater. The junior team has been working hard all year long training and developing their skills, which has paid back in spades with their performance at tournaments both at home and abroad. 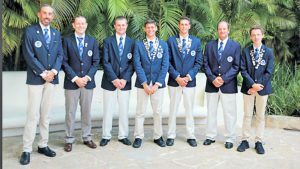 The team took brought home a bronze medal in the Hoerman Cup at the Caribbean Amateur Golf Championships in the Dominican Republic in August, the best showing by the Cayman team since the championship was first hosted in Cayman in 2008. Earlier this year the team competed in the Doral-Publix Junior Golf Classic in Miami Florida, where they were matched up against some top junior golfers from 14 countries and brought home outstanding results, including an 11th place finish in a competitive field of 66 golfers and a ninth place finish in a field of 30. Nineteen junior golfers, girls and boys, played in the Digicel Junior Golf Series at the North Sound Golf Club in May of this year, as a lead-up to the Hoerman Cup. “The junior golf program is grateful to HighWater for their continued support of the annual Cayman Islands Junior Golf Championships – a part of their contribution is directed towards achievement-based prizes used to help send our junior champions to compete at high calibre international tournaments,” said Paul Woodhouse, President of the Cayman Islands Golf Association.